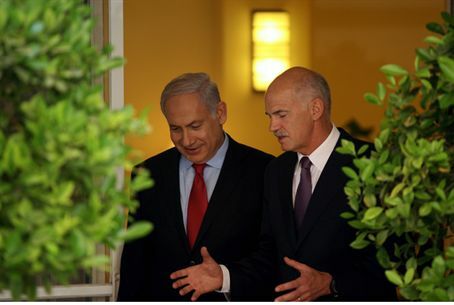 Greek Prime Minister George Papandreou visits Israel, two countries to forge new ties. Greece and Israel will undergo “a major upgrade of relations,” said Prime Minister Binyamin Netanyahu's spokesmen following a meeting between Netanayhu and Greek Prime Minister George Papandreou, whose visit this week was the first visit by a Greek prime minister in decades. Israel's tighter ties with Greece come on the heels of a sharp deterioration in ties between Israel and Turkey. Papandreou denied a connection between the two, telling reporters, “I've been thinking of forging closer ties with Israel for about two years.” However, the history of Greek-Turkish relationships has been characterized more by conflict than by cooperation, with the once violent controversy of the two countries over contorl of Cyprus a noted example. Both countries' national days celebrate victories over one another. Papandreou met with President Shimon Peres, Prime Minister Netanyahu, Foreign Minister Avigdor Lieberman, and Opposition leader Tzipi Livni. He also travelled to Ramallah to meet with Palestinian Authority Chairman Mahmoud Abbas. In his meeting with Papandreou, Netanyahu gave the Greek prime minister a message to pass along to Abbas. “I am not skeptical, and neither are you, about peace with the Palestinians,” he said. The planned upgrade in ties is expected to include closer cooperation regarding finance and technology. Greece has been experiencing a severe economic crisis in recent months. Papandreou spoke to both Lieberman and Abbas about the possibility of direct negotiations between the PA and Israel. Lieberman said that Israel would like to move to direct talks with the PA, but cannot extend a temporary prohibition on Jewish construction in Judea and Samaria as Abbas has demanded. Abbas said the PA would agree to direct talks only if the construction ban continues and Israel agrees to base the borders of a PA state on the 1949 armistice line.